High Performance Glass: Know Types and Applications! Glass is one of the most popular materials which is used in construction. Nowadays glass is used extensively in façade, interior partitions, balustrades, railings for stairs and balconies, etc. Glass can be easily manufactured and cut in different shapes and sizes, which makes it more flexible and versatile. Glass is responsible for transmitting 80% of outdoor heat to the interiors of buildings. For commercial and industrial structures, this is a disadvantage as the cost of air conditioning the structure increases. Thus special high performance glasses are available in the market, which helps in achieving economy of the structure. Coatings of various metal oxides are done on a glass to produce high performance glass, which helps in effective utilization of energy in buildings. Here we have given brief information on various types of high performance glass and their application. Solar control glass is a special oxide coated glass which transfers less amount of heat in the building and also helps in reducing the glare of light entering. While allowing less amount of heat to be transferred, solar control glass allows natural light to pass through it. Thus it reduces the cost of artificial lights. It can be effectively used in commercial areas and educational institutes which are active mostly when natural sunlight is available. For tropical countries like India, this type of glass is very suitable in facades, as it helps in reducing the amount of air-conditioning required. It is used in skyscrapers, glass facades, conservatory roofs, air-conditioned malls and showrooms, etc. Low emissivity glass commonly known as low e glass has excellent thermal insulation properties. It allows only visible light to enter the room and thus gives protection from UV and infrared rays. Due to low emissivity, it allows low transfer of energy between interior and exterior environments. In cold climates, low e glass helps in maintaining the temperature of the interior, as it traps the energy waves and does not allow them to escape outside. Thus they are very economical for colder climates and help in reducing the cost of heating systems. 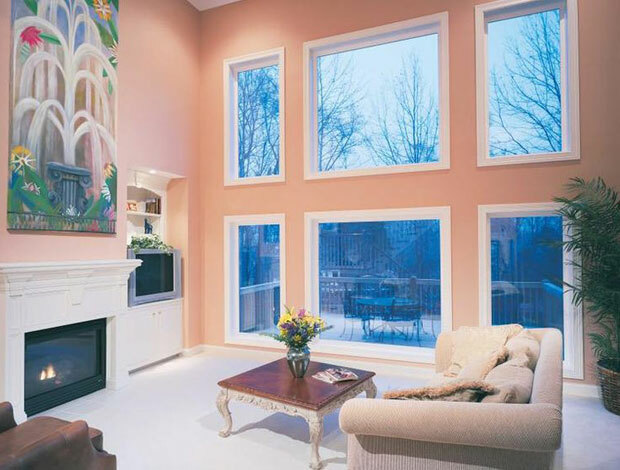 Low e glass is more energy efficient as compared to insulated glass units. They are extensively used in commercial buildings, skyscrapers, glass facades, etc. Solar control – low e glass is a low e glass, which has solar control coating. For facades, which are in direct contact with sunlight, only low e glass cannot be used, as they will trap heat inside leading to overheating of interiors. In such case, solar control low e glass is used, which blocks solar radiation, as well as provides thermal insulation. An interesting example of its application is Burj Khalifa, where this glass is used to decrease the air conditioning cost. For tropical countries, solar control low e glass is extensively used in glass facades, doors, windows, partitions, malls, showrooms, hotels, restaurants, etc. High performance glass is generally used in commercial areas, where energy efficiency is required to achieve an economical operation of the structure. But with awareness, people are installing different high performance glass in residential areas, where temperature conditions are extreme.